One of the greatest challenges of parenting school-age children is managing all.the.papers. It is incredible how many pieces of paper travel with us from school to home each day, and my kids are only in preschool! 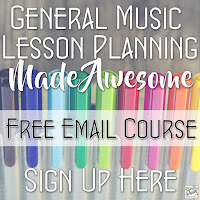 I shared recently how I plan to take control of the paperwork that comes home from teachers- lunch menus, field trips forms, and more- in my purse this year in this post. 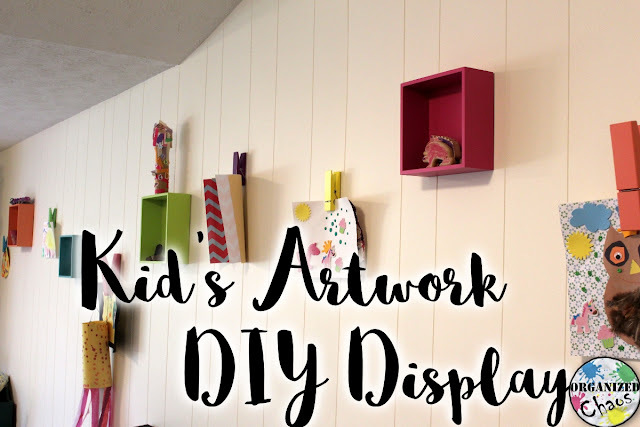 Today I want to share my solution for displaying all of the artwork that my daughters bring home! 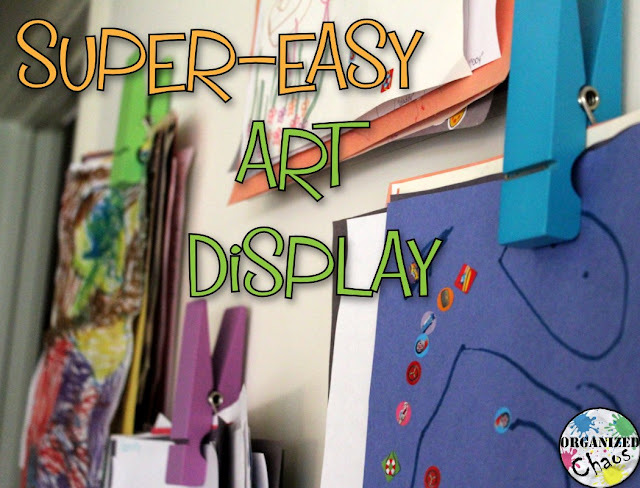 I love this system because it is easy, cheap, fun to look at, and allows me to hang lots of artwork at once so I can display new art the kids bring home, and deal with old artwork later when I have time. 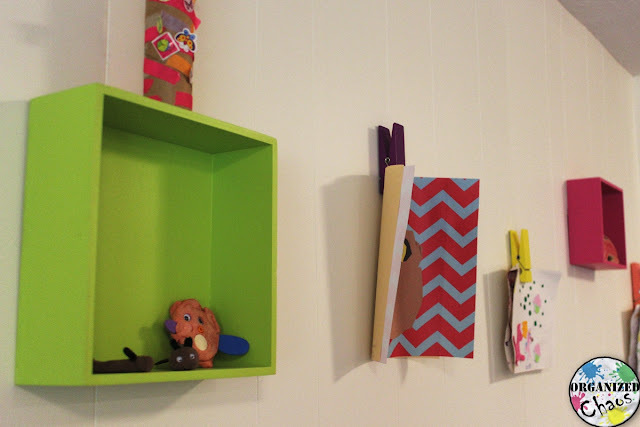 When we moved into the new house a few months after the girls started preschool, I knew we needed an upgrade because 1) they now had a lot more artwork they wanted to display and 2) they were bringing home sculptures and other 3-D stuff that I couldn't hang from a clothespin. I was so happy when I found some more oversized clothespins AND these wooden cubes on clearance at Michael's last fall! The colors are perfect, and the cubes allow us to display their 3-D stuff. They new clothespins are actually bigger than the old ones, but I don't mind. It actually makes everything look more eclectic. I love this wall now! 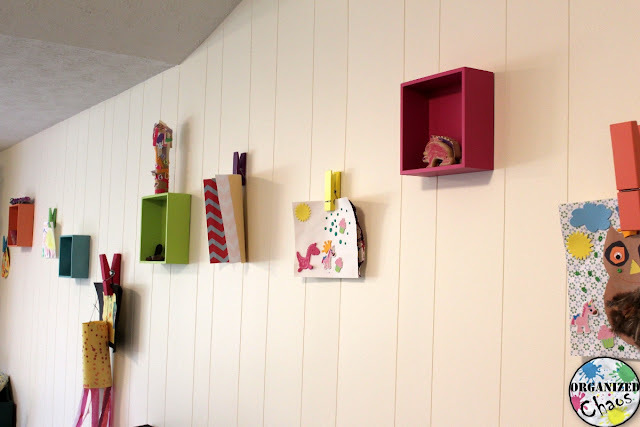 It is so cheerful and fun to look at, and my daughters love seeing their artwork displayed like this :) You can find similar clothespins and cubes at several different stores- I've seen them at Walmart, Target, Michael's, and other craft stores. Now is a good time to look for them on clearance as well- they put these out for college and back to school organization, so check out your local store soon if you think you want to try setting this up for yourself! You can also get some plain clothespins, which you could paint any color you like, here and different colored cubes here if you can't find them in stores. How do you display your children's artwork? I am loving my new display area and can't wait to see the girls bring home this year! Want more? 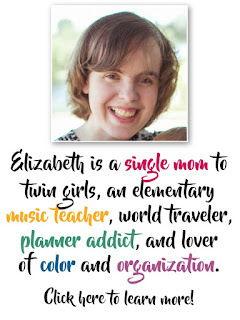 Subscribe here to the Organized Chaos newsletter and get ideas and resources for home and school sent straight to your inbox!